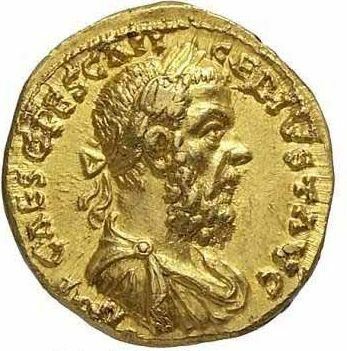 Gaius Pescennius Niger Augustus was Roman Emperor from 193 to 194 during the Year of the Five Emperors. Commodus made Niger imperial legate of Syria in 191, and he was still serving in Syria when news of Pertinax' murder broke. Niger was proclaimed Emperor by the eastern legions by the end of April 193. He took the additional cognomen Justus, or "the Just". In the ensuing civil war against the other claimants - Didius Julianus, Clodius Albinus and Septimius Severus - Niger lost to Septimius Severus. He was captured and beheaded, and his severed head was taken to Byzantium.